Part of the Yamaha Arius family, the Yamaha YDP143 offers an authentic piano feel and sound which is ideal for any aspiring pianist. The keyboard is the GHS (Graded Hammer Standard) which means that the keys are weighted just as they are on a real grand piano. The keys are a slightly heavier feel at the lower end of the keyboard and graduate to be slightly lighter at the the higher end. The YDP143 uses Yamahas superb 'Pure CF' sound engine which ensures that you hear a very high quality sound of the Yamaha CFIIIS concert grand piano. The piano also features 'Damper Resonance' which recreates the acoustic piano's depth of tone whilst pedaling. There is an all new reverb effect which allows you to sound as though you're playing in a variety of environments and with 192 note polyphony available, you won't be experiencing note 'drop off'. The YDP143 is also equipped with 'Half Pedal', whereby the sustain is gradual depending upon the position of the pedal and you can record your performance with the 2 track recorder. 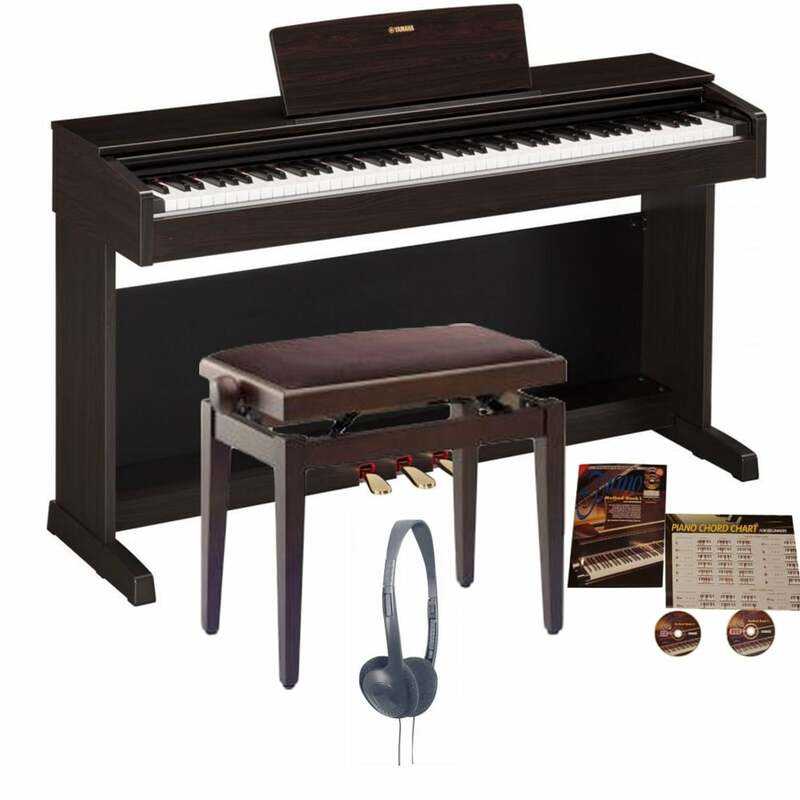 The YDP143 also boast 10 great sounds, from piano, digital piano to strings and organ. A built-in song library of 50 preset songs is also accompanied by a book which also contains the sheet music for you to play along with or practice. Connectivity is taken care of with the dual headphone sockets and the USB-Host connection to allow you to connect up to your DAW. A really great piano for anybody who's either starting out or is a seasoned performer, the YDP143 doesn't fail to impress. The piano is nice and compact and being available in a choice of finishes (Rosewood, Black Walnut or White) it's guaranteed to look good in any environment. The piano tone is very rich and detailed and the half-pedal feature really gives added control over your performance. This piano sounds great and no different to an acoustic piano (to my uneducated ears anyway). It looks good and was fine to assemble. My six year old daughter is learning to play on it and it seems a good fit for her. Amazing piano and amazing service. Shame Yamaha have done away with the piano bookholders! It is very comfy to play on, has a good voice and very high standard. Beautiful quality, wonderful tone. Absolutely thrilled. Thank you. Rimmer offered the best priced bundle online for this unit. The piano itself is outstanding - highly pleased with it. So was the free stool. Prior to delivery, I was advised the music book was out of stock and would be sent separately in the post once supplies were replenished. Rimmer duly sent it and we received it a few days after the piano. The packaging was big and bulky and arrived in mint condition. In summary, outstanding proactive communications and service wrapped around a best value promo bundle. I would definitely buy from them again. We are delighted with our piano! It looks great, sounds lovely and feels like good value for money.